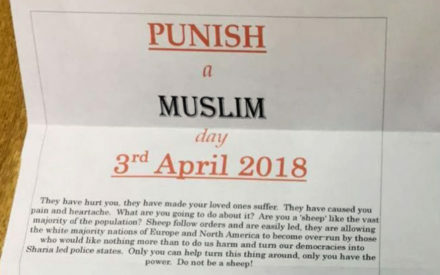 The ‘Punish a Muslim Day’ letters, distributed in a number of cities around the UK calling on people to verbally and physically attack Muslims, and the suspicious packages sent to Muslim MPs over the last few days are shocking but perhaps not surprising in today’s political climate. From violence in the streets to vitriol online, Islamophobia and racism are undeniably on the march in Britain and across much of the Western world. As we enter the tenth year of the worst financial crisis since the 1930s, government tactics that blame migrants, refugees and the most vulnerable in our society have achieved the desired effect of distracting from Tory failures. Stagnant and falling standards of living, decimated public services and unprecedented wealth inequality on a global scale have created a dangerous context of disillusion and desperation. This has instigated the rapid rise of the far-right throughout much of Europe, including fuelling the growth and successes of UKIP, the EDL as well as neo-Nazi groups in Britain. This context has meant that racism, far from being the remit of extreme fringe political groups, has become an acceptable political weapon. The words of Baroness Warsi are as poignant now as when she spoke them at the turn of the decade: “Islamophobia has passed the dinner table test”. From the poisonous rhetoric that surrounded the Brexit referendum to the dog-whistle racism used in Zac Goldsmith’s disgraceful campaign for London mayor, Islamophobia has undeniably become a consistent feature in mainstream political discourse. MPs from all parties have condemned the ‘Punish a Muslim Day’ letters. However, the counter-terrorism legislation of 2015, which includes the notorious Prevent duty, was passed and supported by many of the same MPs. The law both explicitly and implicitly encourages the conceptualisation of Muslims as a separate and dangerous community within Britain, thus institutionalising racist notions that directly fuel Islamophobic hate crime. Prevent is part of the government’s counter-terrorism strategy, first instigated by Labour in 2003. Its remit was widened by the coalition government in 2011, and it was eventually passed into law in 2015. It places a statutory duty on all workers in frontline services to have a due regard for those at risk of being drawn into terrorism. In practice, this means teachers, lecturers, doctors, nurses, psychiatrists and a range of other workers are asked to form a mass surveillance apparatus. Notably, they are asked to report anyone who criticises UK foreign policy, among other dubious indicators of being drawn towards terrorism. This has engendered significant mistrust and alienation for many Muslims, who are disproportionately and unfairly targeted under Prevent. Supporters of the initiative claim that Prevent is intended to tackle all forms of terrorism, including far-right extremism. However, since its inception the majority of resources have been devoted towards the Muslim community. Critics, including shadow home secretary Diane Abbott and her predecessor Andy Burnham, have decried the legislation as “toxic” and counter-productive to its aims. They argue that by stigmatising Muslims and targeting communities with a state surveillance system, Prevent is contributing to a culture of suspicion and mistrust that is alienating the very people it seeks to reach. Labour has pledged to review the Prevent programme, and will assess both its effectiveness and its potential to alienate minority communities. In the meantime, the Labour Campaign Against Prevent has been working to lobby councils to ensure that the most racist elements of Prevent training, which seriously contravene basic rights to freedom of speech and religion, are removed or mitigated, and meaningful risk assessments undertaken. While this cannot be a substitute for repeal, it does provide an important challenge to the institutionalised and accepted racism. To effectively combat the threat of terrorism and heal the societal divides, it is imperative that the next Labour government fully commits to repealing Prevent, as well as fundamentally overhauling Britain’s role in foreign conflicts and its relationships with reactionary and authoritarian states. Becky Boumelha is from the Labour Campaign Against Prevent. Becky Boumelha is a member of Momentum’s national coordinating group, Unite South East's youth and BAME officer, and an Oxford Labour executive committee member.